Sallah: Please, what does it always mean, this. . .this “Junior”? Professor Henry Jones: That’s his name. . .[points to self] Henry Jones. 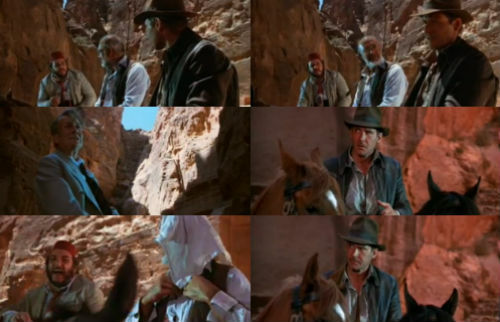 . .[points to Indy] Junior. Sallah: The dog? [laughing] You are named after the dog? AHAHAHA! Posted on July 13, 2012, in Movie Quote of the Day and tagged 1989, Denholm Elliott, George Lucas, Harrison Ford, Indiana Jones and the Last Crusade, Jeffrey Boam, John Rhy-Davies, Menno Meyjes, Philip Kaufman, Sean Connery, Steven Spielberg. Bookmark the permalink. Leave a comment.